*Farrier's Formula® does not contain added sugar or molasses. The daily intake of starches, carbohydrates (WSC and NFC), and sugars from Farrier's Formula® is very low, and is insignificant relative to the starch, sugar and carbohydrate intake in the total diet. 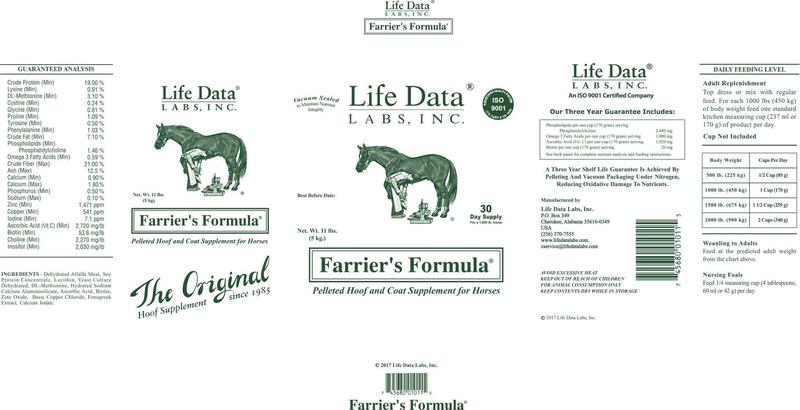 **Farrier's Formula® does not contain added potassium; however potassium is contained in minor concentrations with some of the ingredients such as alfalfa. Considering the small amount of product, the total level of potassium intake from Farrier's Formula® relative to the intake in the total diet is not significant.